our luxury Flowers and Champagne gift set. 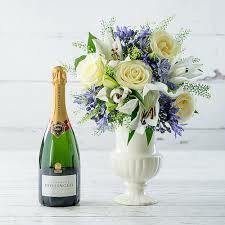 Featuring Bollinger Champagne and a bouquet of white avalanche roses, blue agapanthus and scented white lilies. Together they are a sensory sensation. Vase Not included.